The Midge and Gnat were designed by W.E.W. "Teddy" Petter. Petter had grown suspicious of the trend towards bigger and more expensive combat aircraft, and he felt that a small, simple fighter would offer the advantages of low purchase and operational costs. New lightweight turbojet engines were being developed that would be able to power such small fighters. Petter became managing director of Folland Aircraft and in 1951, using company funds, he began work on his lightweight fighter concept, which was designated the "Fo-141 Gnat". 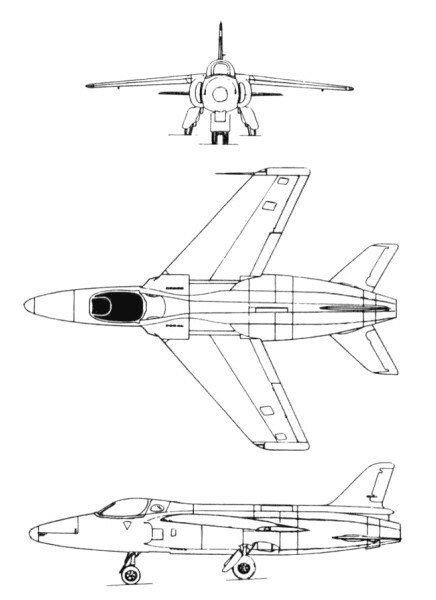 The Gnat was to be powered by a Bristol BE-22 Saturn turbojet with 3,800 lbf (16.9 kN 1,724 kgp) thrust. However, the Saturn was cancelled, and so Petter's unarmed proof-of-concept demonstrator for the Gnat was powered by the less powerful Armstrong Siddeley Viper 101 with 1,640 lbf (7.3 kN / 744 kgp) thrust. The Midge features hydraulically powered "flaperons", main gear that could be used as airbrakes, and a one-piece canopy that hinged over an inner armoured windscreen. The demonstrator was designated Fo-139 "Midge". The Midge, serial number G-39-1, first flew on 11 August 1954 from Boscombe Down, Wiltshire, with Teddy Tennant at the controls. Despite the low powered engine, the little jet could break Mach 1 in a dive and was very agile. The wings contains no guns, undercarriage or fuel tanks. The Midge was evaluated by pilots from Canada, India, Jordan, New Zealand, and the US Air Force, and had performed a total of 220 flights when it was destroyed in a fatal crash on 26 September 1955, with a Swiss pilot at the controls. However, the Midge had demonstrated that Petter's lightweight fighter concept had much going for it. Folland went on to develop a full-scale Gnat prototype, also using company funds. Original film footage of the Midge can be seen in the 1956 British science fiction film "Satellite in the Sky". The Midge portrays a fictional jet fighter used to test an experimental rocket fuel. Undercarriage track: 5 ft.1 in.